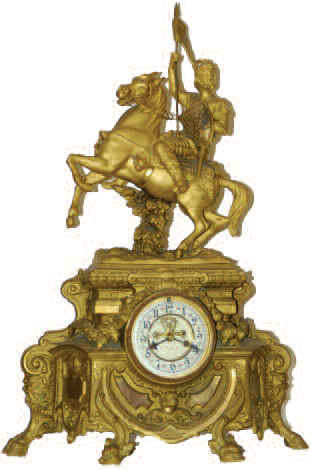 Waterbury Clock Co. "Crusader", ca 1906, one of their largest and most appealing large statue clocks. It stands 27 inches high and is 18 inches wide. Finished in a rich Roman gold plate it is retaining a very significant amount of the plating. 8-day movement, striking a gong on each half hour and hour, 2-piece porcelain dial with open escapement, Rocco cast gilt sash and bezel, heavily beveled glass, all being very nice. Sold new for $45, which was a healthy chunk in 1906. There are too many unusual features to this clock to mention them all; water serpent heads for front feet, rams hooves for back feet, God of War heads cast on each end, and numerous other emblems and trinkets cast in the base. Even the back of the case has very ornate castings. This clock has been around here for years and I will be sorry to see it go, as it has become a favorite of ours. We like big clocks. Ly-Waterbury No. 1220.